The spine is evaluated as part of a screening examination or to assess pain or deformity. Screening examination Is there some underlying disorder? Marfan syndrome, neurofibromatosis, ostoeochondrodystrophies, or mucopoly-saccharidoses are readily obvious in the older child but may not be so apparent in the infant. History Inquire about the onset, progression, disability, and duration. Family history is of great importance because scoliosis and hyperkyphosis are often familial. Back pain is also familial. Posture Note asymmetry of shoulder height, scapular prominence, flank crease, or asymmetry of the pelvis. Note any skin lesions, especially those in the midline. The presence of midline skin lesions, such as dimples, hemangioma or hair patches, cavus feet, or leg atrophy, are often associated with underlying spinal lesions. Be aware that minor truncal asymmetries occur in about 10% of children. These are benign, cause no disability, and require no treatment. Avoid calling attention to such normal asymmetries because it only worries the patient and family. Forward bending Perform the forward bending test. This is best done with the examiner seated in front of the child. Control the child’s forward bend by holding the hands together. Slowly guide the child’s forward bending while observing the symmetry of each level of the spine. Any significant scoliosis will be readily apparent. Assess asymmetry with a scoliometer, which measures inclination. Minor degrees of asymmetry are usually on–ly a variation of normal, but require follow-up examination. If any abnormalities are found, a detailed physical and screening neurological examination is essential to avoid diagnostic errors. Hesitation, a list to one side, or restricted motion is abnormal. Lesions such as spinal cord tumors, spondylolisthesis, disc herniations, or discitis limit the mobility or symmetry on forward bending. Side view As viewed from the side, the back should curve evenly without any sharp angulation. A sharp angular segment of the spine is seen in Scheuermann kyphosis. Neurological examination should be part of the examination. In addition to the routine assessment, assess abdominal reflexes. Absence or marked asymmetry suggests a subtle neurological abnormality that may indicate the need for more intensive neurological investigation, such as MRI. 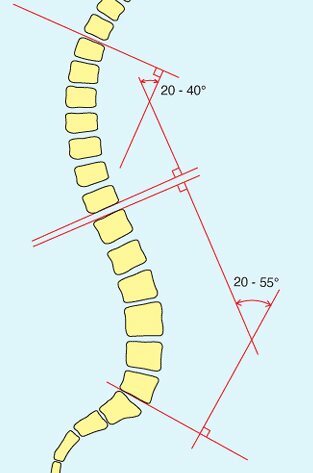 Radiographs and other imaging studies are indicated to measure the vertebral curves and to further assess specific problems identified by the physical examination. Radiographs Make PA and lateral spine films in the upright position on 36-inch film using shielding and techniques that avoid excessive radiation exposure. Order oblique lumbosacral views to assess the pars if spondylolysis is suspected and not seen on lateral view. SPECT Single-photon emission computed tomography imaging is useful to assess subtle pars reactions. CT studies are useful to detail bony deformities or lesions. MR imaging is used to study patients with neurological findings, those with unexplained progression of deformity, and certain types of deformity, as well as preoperatively for children with neurological impairment. These studies are helpful in evaluating tumors, congenital abnormalities such as Chiari malformation, various cysts, tethered cords, and filum terminale anomalies. Multiple studies order only those imaging studies that are definitely necessary during the initial evaluation. Normal variability Measurements of deformity are made from standing radiographs. Be aware of the normal range in the sagittal plane. Frontal plane Mild curves that cause truncal asymmetry are usually normal variants. These variations are <10° by Cobb and <5° by scoliometer measure. These asymmetries have not been shown to cause any disability in childhood or adult life. Bone scans are usual in assessing back pain when radiographs are negative or equivocal.